In our first craft beer article, we discussed the local beer industry in general. Now we are ready to throw back a few pints while visiting the places where the magic really happens: our local bars and restaurants. Let’s walk the town center together to find out what’s on tap. I cross Red Road and turn on Sunset Drive on my way to Splitsville Luxury Lanes in The Shops at Sunset Place. The interior is impressive, all wood and red leather, and the welcoming bar makes it a great place to enjoy a drink even if bowling is not in the cards. Ruben Valdes and Sean Moore, the GM and assistant GM, are gregarious and hospitable. Asked about how they select their craft beers, Ruben explains that they periodically gather samples of what is available and new and have a tasting to arrive at the right mix. “It takes a while, we’re a little OCD when it comes down to our options,” he explains adding that all the local beers they currently carry sell extremely well. Their current favorite is The Tank Brewing Co. Freedom Tower Amber. They are not alone. The Tank comes up often in conversations with people in the local beer scene and is setting a high bar for quality and craftsmanship. State-of-the-art brewing, passion and attention to detail are some of the hallmarks of this brewery and their beers. 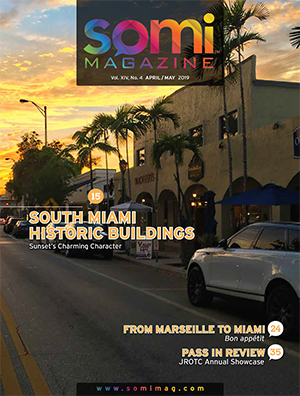 Located in Doral, it is slated to open its taproom to the public around the time this article goes to print. Ruben pours me the Freedom Tower Amber, and I see what the fuss is about. It is exceptionally smooth and balanced, with a malty-caramel core of flavor supported by subtle hops. There are plenty of beers to try at Splitsville and taps rotate often, so make sure to check in with your bartender for the latest offerings. I thank my gracious hosts and head out. Turning right as I leave the Shops, it’s about a minute walk to reach Station 5 Table & Bar. Tiny and tidy, this restaurant is a small, hidden gem. Proudly local with a well-defined identity, it’s one of the more welcoming and luminous bars and dining rooms in the area. I am met by Emily Patty, Station 5’s bar manager. 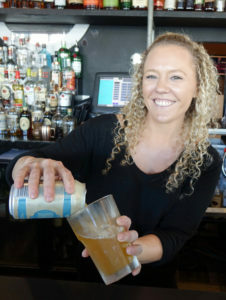 An articulate believer in the restaurant’s mission, she tells me that their motto, “handmade and homegrown,” fits right in with the idea of promoting local brewers with a similar mission. “All of our taps are rotating taps,” Emily explains. “Nothing is set here. We like to keep bringing in new products, all kinds of fun beers.” She keeps eleven out of their twelve taps stocked with craft beer, preferably local. “I feel the craft beer community in Miami is like a family. And we are a very small mom-and-pop restaurant, so we fit right in with that.” She rotates the offerings about every other week, and the restaurant participates in frequent collaborations with local producers. Her current favorite beer is Bousa Brewery’s B-A IPA. 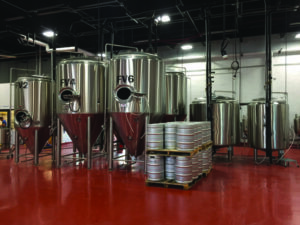 Bousa is located in the dynamic Little River area and is one of the newer breweries in Miami. The ‘B-A’ in B-A IPA stands for British-American, which emphasizes the richer, more malty profile of this IPA. Emily recommends the Famous Braised Short Rib Tacos as a pairing, and she is spot on. By the way, the tacos are topped with cheetos (I know!) and were as delicious as Emily promised – a perfect foil for this generous, full IPA. Emily feels Bousa’s motto, “Simply Good Beers,” is right in line with Station 5’s mission to present simply good food. There’s a lot that’s genuine and down-home about Station 5 that is worth seeking out. I walk out into the cool breeze and the waning sun feeling pretty good. I head left on Sunset and snake my way down to Town Kitchen & Bar, just a few blocks away. Always busy, Town has become one of the landmark spots in SOMI. I’m welcomed by manager Krizia Aguilera, and we walk over to the bar. While Town’s dining room is warm and almost cozy, the bar – backed by large windows – feels bright and open, particularly during the day. The patrons look relaxed and in great spirits as they chat with each other and with bartender Emily Scott. I ask which craft beers are most popular, and Krizia and Emily agree that Cigar City Brewing’s Florida Cracker, a Belgian-style white ale, is a costumer favorite. Cigar City is Tampa Bay’s and one of Florida’s best known breweries, and boasts a strong lineup and wide distribution. The Florida Cracker ale, made with light, unmalted wheat and flavored with orange peel and coriander, is citrusy and refreshing. While they don’t have taps, the restaurant offers a selection of bottled craft beers, many of them local. Another favorite here is Funky Buddha Brewery, from Oakland Park. Their Last Snow Coconut & Coffee Porter small batch beer, is dark and unctuous with a potent nose, and is a big hit with diners as well. Funky Buddha has one of the most popular taprooms in the area and produces a wide array of styles and quirky small-production beers. As Emily pours out the Florida Cracker into a glass, a few of the locals crane their necks and ask about it. A lively conversion about beer ensues. While I would love to stay, I still have a few more places to visit, so I say my goodbyes and head out. As I open the door at Buffalo Wild Wings, I’m drawn in by the music and the frantic action unfolding on multiple oversized screens. A Premier League game plays on one, basketball on another. Cheers ring out from different groups depending on which screen they’re facing, and an energized, fun vibe fills the restaurant. I sit at the long bar and am soon joined by Seth De Kanter, proprietor of several Buffalo Wild Wings restaurants in the area. 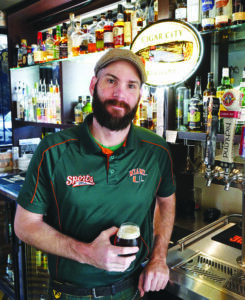 When I ask how actively he tries to source locally crafted beers he explains, “Over the last two years, the craft beer scene in Miami has gotten really exciting. For instance, I have 30 taps here, 20 of which I get to play with, and out of those about half are local beers.” He mentions The Tank Brewing Co.’s La Finca Miami as his current favorite and adds that J. Wakefield Brewery’s Hops 4 Teacher IPA is one of the most popular with customers. Jonathan Wakefield started out as a home brewer and crowd-sourced the funds to start his eponymous brewery in Wynwood. He is known for the skill and creativity with which he crafts a variety of styles with adventurous and idiosyncratic twists. In discussing the popularity of local beers, he says “I think what’s happening is that people are starting to identify the producers they like. So they’ll go into a place and see the name they know, and they’re willing to give whatever’s on offer a try. I think a lot of brewers are doing smart things, where they’ll have a good session beer, a good everyday-drinking beer to get people in, but still a little different from what they may be used to.” He sees it as a way to initiate drinkers into the world of more complex craft offerings without overwhelming them. As more patrons file in and the restaurant starts buzzing, I thank Seth for his hospitality and head for the last two stops on my tour. As I cross Red Road once more, night is falling. People are heading home or out to dinner, walking hurriedly in the slight chill of this gorgeous Miami night. I open the door and walk into Shula’s 347 Grill, entering an atmosphere much different from that of any other place I visited today. The decor is elegant, with an imposing bar, dark upholstery and the lights dimmed just right. The hostess kindly seeks out Eddie Acevedo, COO of Grove Bay Hospitality Group. 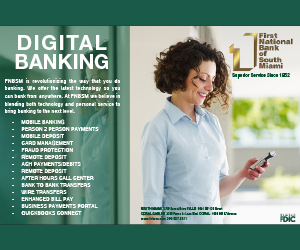 The group manages and operates several restaurants in Miami, with more to come in the next few years. 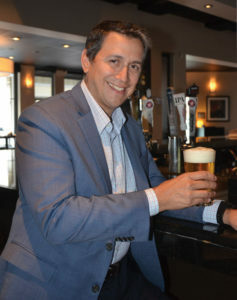 Eddie holds a First Level Cicerone beer certification and is very involved with the beer selection at his restaurants. 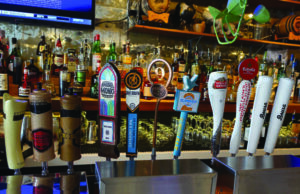 Shula’s currently offers two local beers on tap, and Eddie is big on both of them: The Tank’s Freedom Tower, and Concrete Beach Brewery’s Rica Wheat IPA. Concrete Beach Brewery was one of the first breweries in Wynwood, and was founded by Alan Newman, of Magic Hat Brewing Company fame. The Rica Wheat IPA is a departure from typically mild wheat beers and packs a hop-punch both on the nose and on the palate. Eddie is bullish on the state of the craft brewing scene in Miami, which he describes as being in “hyper-drive.” We chat about several other breweries in the area, including Biscayne Bay Brewing Company and MIA Brewing Company, both of which also boast a solid beer line-up. The restaurant is buzzing, and the bar is packed. 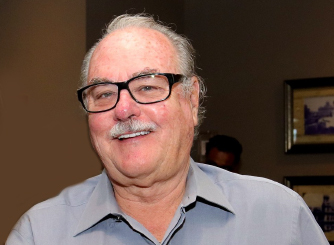 Eddie says Shula’s is the quintessential place for locals to meet, unwind or do business. “Like Cheers”, he says, “where everybody knows your name.” After a quick trip to the bar, I head back out toward my last drink of the night. Walking into Sports Grill on a busy night is a rush! The place is literally packed and pulsing with activity. Sports playing on multiple screens, people walking in and out, music. It’s invigorating, fun and for many locals, one of the top places to watch football and other sports. It’s also a great place to drink a craft brew while enjoying their excellent wings. Alexander “Fitz” Fitzgerald, Sports Grill’s bar manager, joins me at one of the hi-tops. Currently their taps feature a few selections from many of the breweries I saw represented during my drinking tour, but Fitz highlights Funky Buddha’s Floridian as a customer favorite here and calls it “a bigger, better Blue Moon.” He also happens to mention he is about to change out the Wynwood Brewing La Rubia keg. La Rubia Blonde Ale (la rubia means blonde) is an immensely popular beer that was represented in almost all the tap lineups in the area. Established by a father-and-son duo, Wynwood Brewing Company was one of the first breweries to open in Miami and is one of its most popular. Their tap handles, beautiful wood cylinders shaped like upside down spray paint cans, are easy to spot and pay homage to Wynwood’s famous murals. 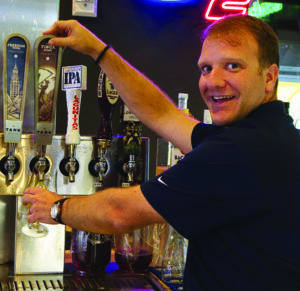 Sports Grill promotes local breweries with a monthly tap takeover and during their very popular happy hour. With this one last pint my tour comes to an end. As I visited all these great restaurants and discussed and tasted our standout local beers, including Titanic Brewing Co.’s, in a previous article, I mused that beer may be the one local product that can capture Miami’s vibe better than any other. Idiosyncratic, authentic, fun and sometimes a little brash, beer is a perfect conduit for local craft talent and creativity. 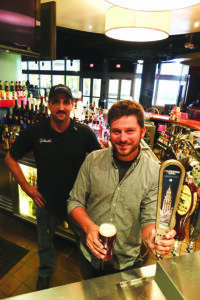 Local breweries are adapting to what works for our local weather and taste as well. With the right outlets available to showcase them and the right people brewing them, the quality of local craft beers continues to improve and to capture an ever-broader market. It’s a great time for craft beer in SOMI!